Meredith Monahan is the matriarch of Pearl Bay, with a pedigree that goes back generations. Meredith's family owned most of Pearl Bay until the money went AWOL some years ago. The last family asset is the Tropical Star, which she now runs. As well as being the local pub, it is Meredith's ready tool for the cultural enrichment of her patrons. 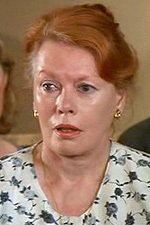 Jill Forster came to Australia in 1964 as a young model. After appearing in a television commercial she was quickly pursued by Dorothy Crawford of Crawford Productions and her acting career blossomed. Her first role was in the Australian TV series Hunter. It took her on location to Woomera in South Australia for six weeks. She loved the experience and it was then she decided she wanted to act full time. Her credits include roles in such Australian classics as Number 96, The Box, Prisoner and The Restless Years, and more recently, The Man From Snowy River, A Country Practice, Power And The Passion and a five-year stint on Beauty And The Beast. She received a nomination for Best Actress for her performance as Mrs Haversham in Great Expectations. Jill also received an AFI Award for Best Actress in a Supporting Role for her role in the feature film Libido, and a nomination for Best Actress in a Supporting Role in Say A Little Prayer. Jill is married to actor John Stanton. She has a passion for growing roses and has more than 400 rose bushes at her country home. 'Her public persona is friendly, smiling and open but underneath there is sadness and even some bitterness at having missed out on what she would like to have had in life — family and children.' — Jill Forster.